In traditional hot-stamping, an image is engraved onto an aluminum plate. The plate is heated and pressed against a “foil” and into contact with the substrate, transferring the image from the plate to the substrate. The foil may be metallic, silver or gold for example, or it may be any of a variety of solid colors. Hot-stamping can also be used to simultaneously emboss the substrate. Other stations on the hot-stamping press can overlaminate and die-cut the part. Cellotape has taken this process one step further. 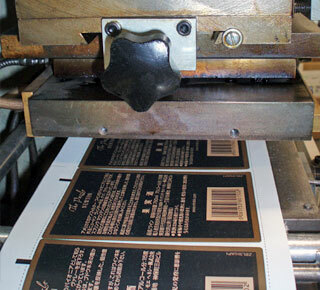 With a thermal transfer printer mounted to the front end of the press, we are able to add variable data, like barcodes and sequential numbers, to the part, permitting us to efficiently produce serial number and barcode labels with a solid color foil background including, if desired, your logo.